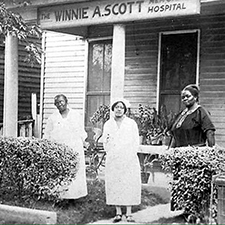 As part of honoring and celebrating #BredHistory during Black History Month, Kentucky State University is looking back at some of its trailblazing alumni. 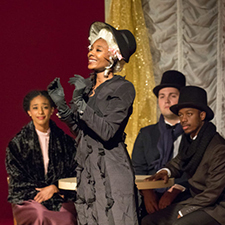 The Kentucky State University Opera/Musical Theatre Workshop will present its third-annual GALA under the direction of Dr. Caroline G Gibson. 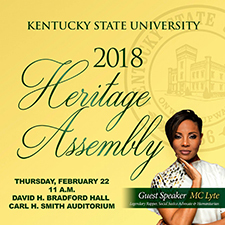 Kentucky State University students learned about the institution’s heritage and heard an inspiring message from legendary rapper, social justice advocate and humanitarian MC Lyte during the 2018 Heritage Assembly recently. Kentucky State University students, faculty and community members have the opportunity to meet nationally acclaimed educator Peggy Brookins Tuesday, Feb. 20 for informal discussion on the University campus. 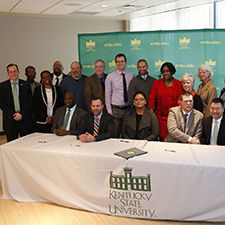 Kentucky State University and Hope Street formally announced their partnership in the creation of the Opportunity Access Network Feb. 15 on the University campus. 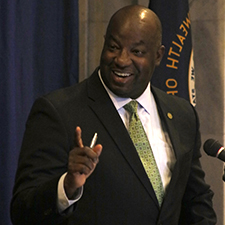 Highlights of the Kentucky Black Legislative Caucus Black History Month Celebration, including President Brown’s keynote address, were recently featured on KET’s Legislative Update. Kentucky State University students earned a home-style Valentine’s Day lunch by learning the steps of the financial aid process at the University. 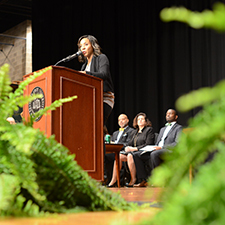 Kentucky State University and Hope Street Group (HSG) are growing their current partnership to further advance opportunities for educators and students.